As a marriage celebrant I have been so lucky to be able to marry some of my very dear friends and family. I met Narissa over 10 years ago when we participated in a year long leadership course. We clicked pretty instantaneously, and although we don't see each other as much as we'd like, we know we can message each other whenever we want! Today is the one year anniversary of Narissa's wedding to Steve at Hillstone St Lucia and so I share her tips for ensuring your wedding day is amazing. 1. Spend money on whatʼs important to you: This was some of the best advice given to me by a friend. Decide on the must haves you want as a couple and budget around these. For us having a really good photographer was important and a venue where the food was great. We were happy to spend less on other things and direct our money more to the important things that we wanted. 2. Recycle & Revamp: Everything as far as decorations went, they were secondhand or purchased cheap and revamped. At the beginning of my planning I put a lot of pressure on myself on having the best table decorations and bonbonnieres. I kept getting drawn into all these beautiful candles and gift sites that you see at expos. I found table napkins and bonbonnieres second-hand. Instead of purchasing extra flowers we just use our bouquets to decorate the bridal table. In the end I decided table decorations and bonbonnieres were not going to make or break our wedding day so I kept it simple and gave myself a budget of $200. 3. Build relationships: Your suppliers will ultimately reflect you as a couple. So, trust your gut with this. Do what you need to do. For me having trials, conversations and meeting with suppliers was the best way for me to know what was going to work. Some suppliers I didnʼt gel with and others things just fell into place straight away. Some choices are no-brainers. For us choosing our wedding celebrant (Fiona from Coastal Weddings) was our quickest decision. We wanted someone we could both ultimately feel comfortable with, got us as a couple, was quirky but fun and who was going to invest in us as a couple. Everything fell into place with Fiona and we never question our decision. 4. Being open to change: This was so important which allowed for things to happen and change easier. In the beginning I was set on certain colours and a particular look and feel for our wedding. However as things started to come together I quickly realised that I needed to adapt in order for everything to come together as well as it did. This meant completely changing my theme and colours three months out from the wedding. Because I had tried to keep the colours quite neutral by picking “gold” as my dominant colour I could then match anything really to this. 5. 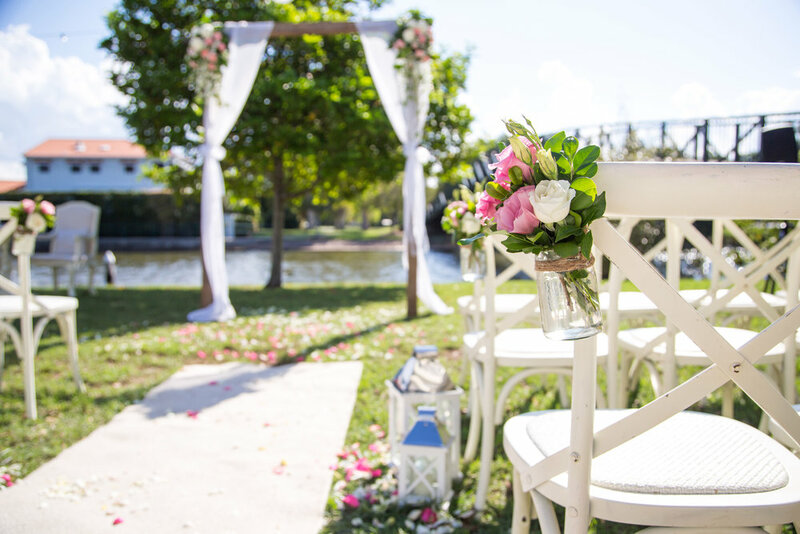 Donʼt sweat the small stuff: Everyone is going to have an opinion on whatever you do for the wedding whether it is the guest list, seating plan, venue choice, date etc. Remain true to what is important to you and your partner and what you both want for the day. When I would get stressed with the planning, the budget, suppliers, changes, Steve would always say to me “It doesnʼt matter what happens, as long as you are there on the day”. Now, isnʼt that what itʼs all about? Your love for one another. And, he was right. The seating plans, flowers and wood arrows that I was lying awake thinking about at 2 oʼclock in the morning didnʼt matter on the day when we were both standing there in front of each other." One of my gorgeous couples from 2017 recently celebrated their one year anniversary! So in a fitting way to help them celebrate, let's re-live their wedding and fall in love with them through their story! The love story between Megan and Donald started when they worked together at a solar company in Brisbane. Both were in relationships at the time, so they became friends but lost touch when they both left the company. Donald travelled north for work, and a few years later reconnected with Megan on Facebook. It was now that their timing was right. They clicked (literally) and soon started dating – and not just dating, but maintaining a long-distance relationship for two years. This was the first test of strength, honesty and trust for Megan and Donald, and, where many have failed, these two succeeded. Donald eventually moved back to Brisbane, and they tested the next stage of their relationship – moving in together. Once again, they succeeded, so they decided to test the ultimate faith in their relationship – buying a house to renovate. Thankfully Megan had already accepted Donald’s proposal by this stage and now, with their renovations almost complete, they look forward to moving onto the next phase of their lives. 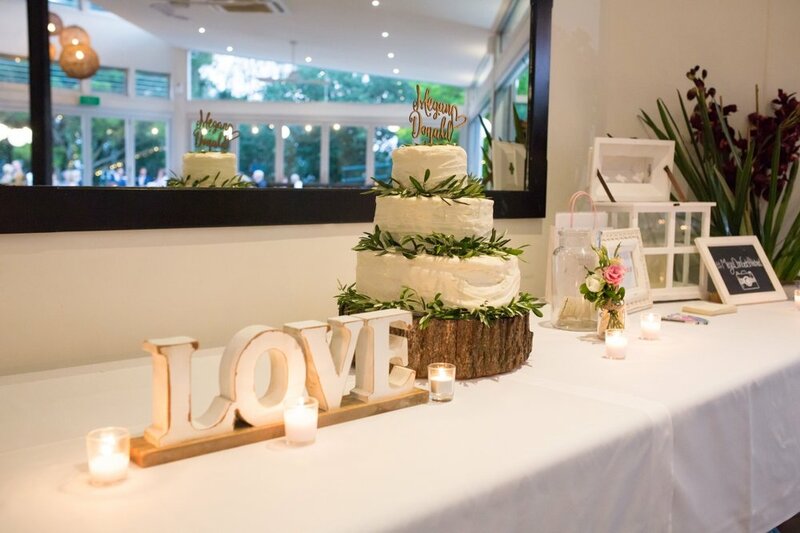 Megan and Donald celebrated their ceremony and reception at the Noosa Waterfront Restaurant & Bar surrounded by 100 of their closest family and friends. With afternoon thunderstorms predicted, plans A to D were put in place for the ceremony. Thankfully the weather held out and the ceremony went ahead as originally planned. 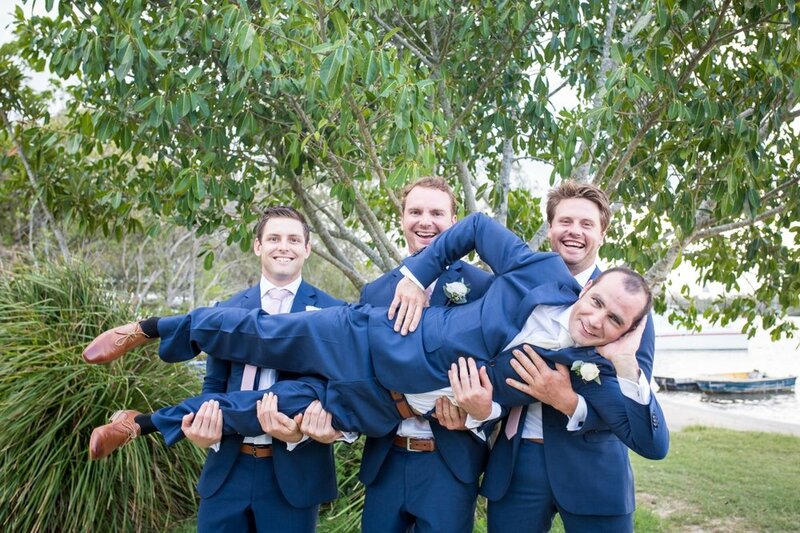 It was really important to the couple to have a laid back wedding day with their friends and family and they achieved this by carefully choosing their suppliers. 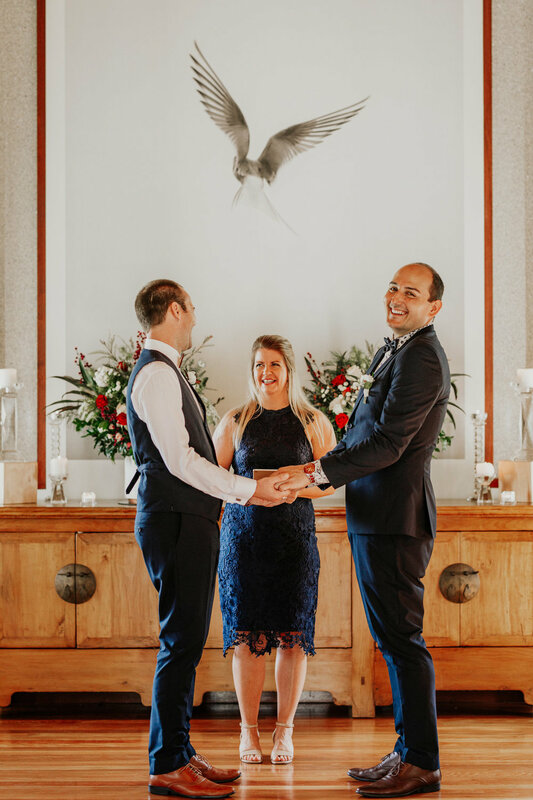 After meeting a number of celebrants, they chose Fiona Duce from Coastal Weddings who worked closely with the couple to create a fun ceremony, with a focus on their love story. 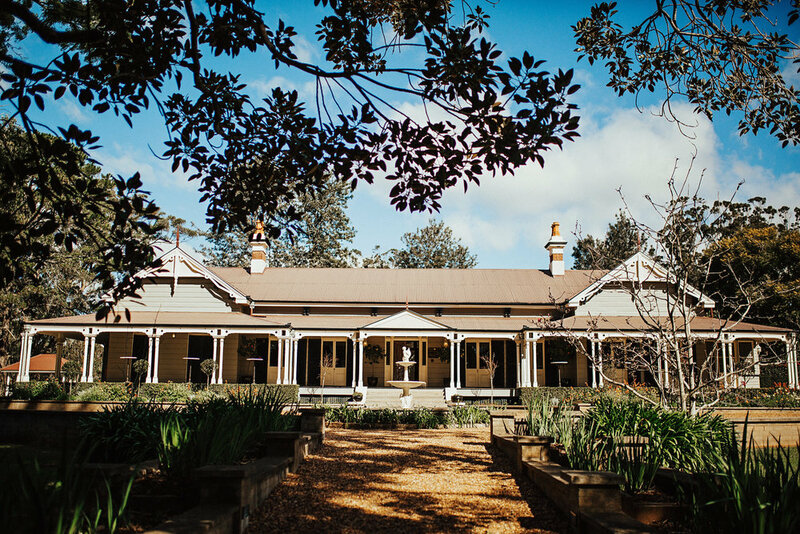 Photographer, Amy Hinks kept the day light and fun and captured great natural shots and wedding stylist Annie from First Class Functions kept Megan’s stress to a minimum by carefully planning the final touches for the day. 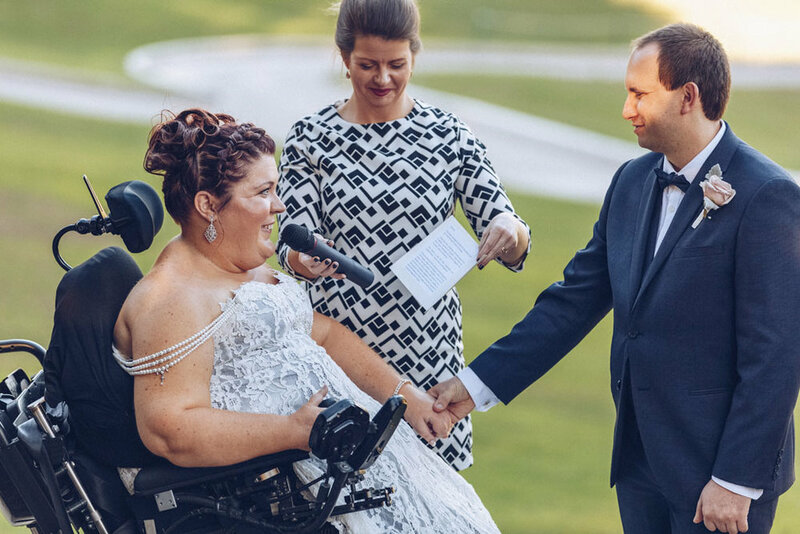 The couple said the best part of their wedding was spending time with their closest friends and family. Megan said, “We both had an amazing day and got to catch up with friends and family that we don’t get to see too often. “It was a very humid day and it got very hot inside the restaurant as the meals were served, with more than 100 guests inside. Luckily, we had seating areas set up by First Class Functions on the lawn outside the restaurant overlooking the water. They set up lounges and tables and chairs for guests to spread out after dinner, which helped everyone cool off and created an interactive and fun environment. 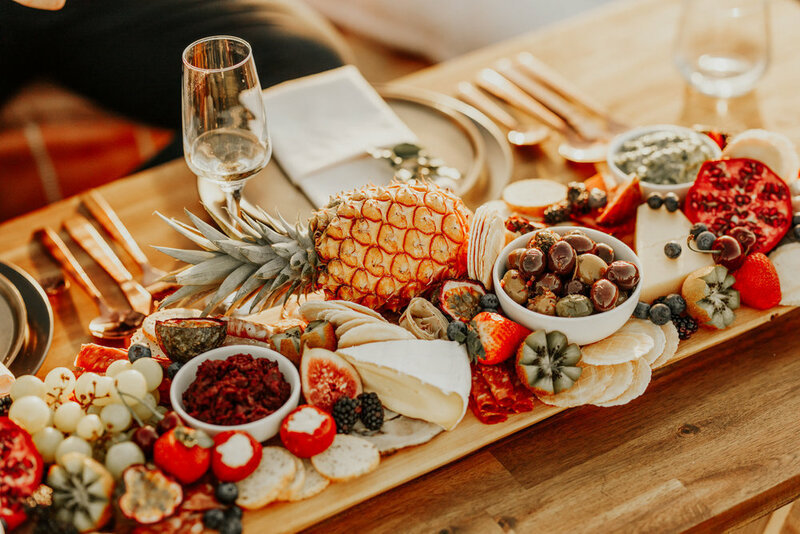 Ever since I was involved in an amazing photoshoot at Gabbinbar Homestead mid 2017, I've been so eager to be involved in a styled shoot in my neck of the woods on the Sunshine Coast. What better way to celebrate the passing of the new marriage legislation by pulling together some amazing Sunshine Coast vendors and heading to the hinterland with a gorgeous couple for a photoshoot. You may recognise this couple - they've been in the Sunshine Coast Daily on several occasions (you can see them here and here). They've been such strong advocates for marriage equality. You can see the passion in their eyes with each other, and the pleasure knowing that they can now legally marry within their own country. We started out at the beautiful Annabella Chapel (Ilkley) before moving onto the most photographed location on the Sunshine Coast - One Tree Hill, Maleny. One Tree Hill is a privately owned working cattle farm that wedding parties and photographers can gain access to by booking and paying a donation to the Woods Family. Margaret Woods and her family have donated $40,000 to charity over the time that they've welcomed people onto their property. It is with great sadness that Margaret passed away during December, however her legacy lives on through her family and the community of Maleny. Florist – The Posy Co. Welcome to my first blog post on my new website! I hope you've taken the time to look around and get to know me. My blog posts will be a combination of tips from vendors and couples, real life weddings and stories about me, so you can get to know me better. There is no better story that I love hearing from couples than the proposal. So, I thought it would be fitting to share our proposal with you for my first blog post! My husband Ritchie and I were taking our first holiday together about 18 months into our relationship, and this was a big one - going to Melbourne, spending time with extended family with the highlight of the trip going to the MotoGP at Phillip Island. It was really a great holiday - eating, drinking, dancing, laughing, meeting new relatives, meeting old relatives, seeing sights, loving life and loving life being together. So when a cousin recommended taking a trip to Rialto Tower and seeing Melbourne from the top we thought it was a brilliant idea. Strolling along the observation deck, enjoying the sights, I jokingly mention to Ritchie 'If you'd been romantic, you could've proposed here', and I was hit with a look of bewilderment. Little did I know I just stole his idea! We go out to the balcony to check out the last light over the city with the lights coming on. When I suggested going back inside, Ritchie wanted to stay out a bit longer. Now I'm starting to think this situation is weird, until the balcony becomes clear of other people, and Ritchie drops to one knee. Those who know Ritchie will understand when I say he's a practical joker so when I see him on bended knee, my automatic response was naturally 'Get up you stupid idiot!!!' - in a nice, loving way of course! I have no idea what Ritchie said to me that night on the balcony. I'm sure it was words of love and promises to spend our lives together, but eventually I did say yes and blubbered like a fool, ruining my makeup in the process. There was no ring, there was no asking my parents for permission, it was just us, and the brilliant lights of Melbourne. And it was perfect. Had I known two days later I'd be sitting the pouring cold rain with the winds of Antarctica blowing into Phillip Island while watching the MotoGP I may have reconsidered my answer. PS For those interested, Valentino Rossi dramatically won the race despite a 10 second penalty.